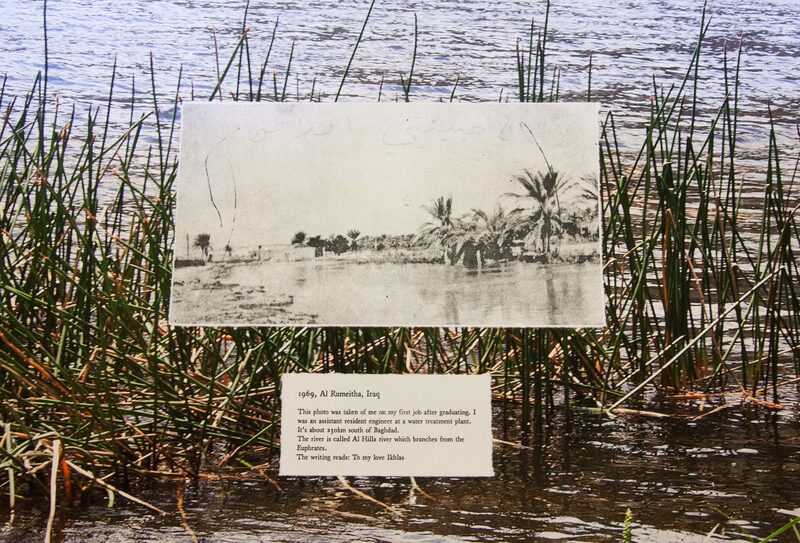 The Berlin-based artist Nadine Hattom’s installation Until the River Winds Ninety Degrees West, commissioned for ‘Archaic,’ the Iraq Pavilion at the 57th Venice Biennale, reflects on her family’s history and the ancient traditions of the Mandaean community that she grew up in. The Mandaeans are a religious group from southern Iraq whose cultural practices particularly relate to water and who revere John the Baptist. 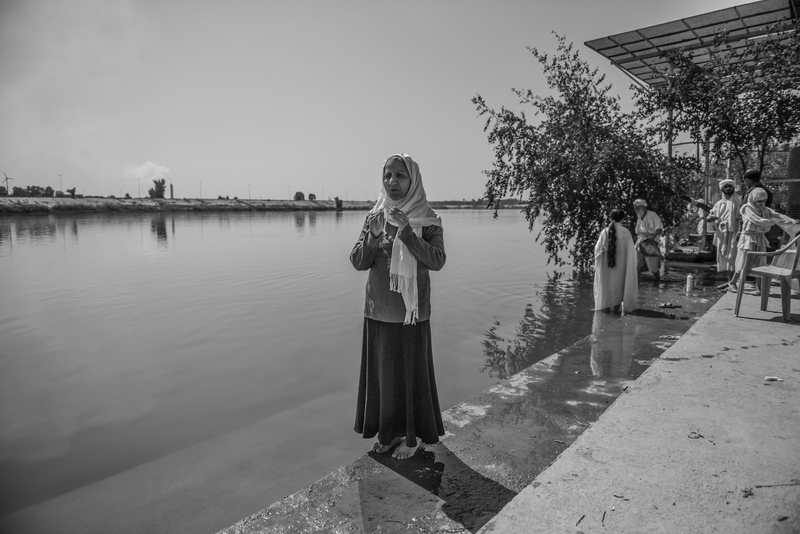 Below, Hattom speaks to Ruya about her research into the Mandaean religion and its community. 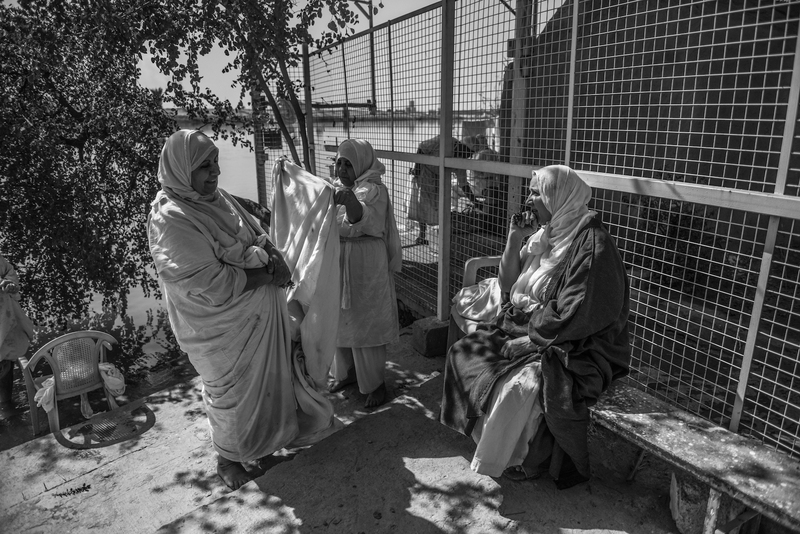 The photographs were taken in Iraq earlier this year by the Baghdad-based photographer Ayman Al Amiri. Mandaeans are secretive about their religion. Only initiated priests have access to the scripture and teachings. 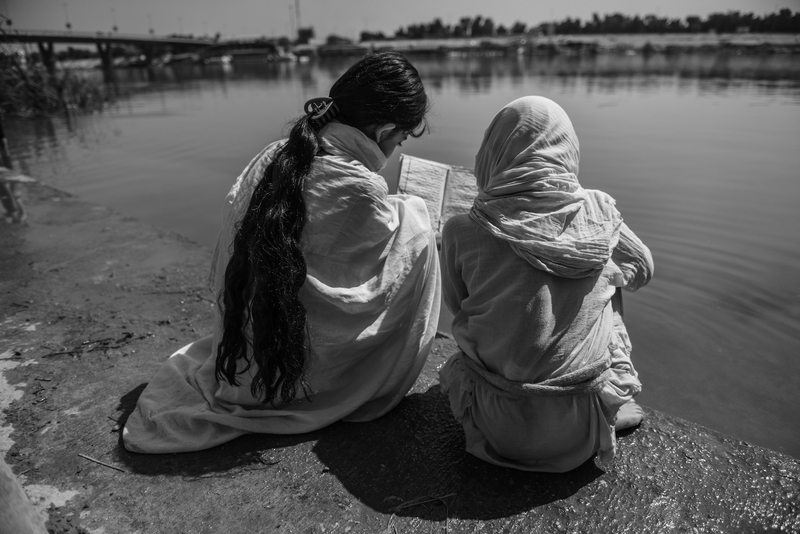 For centuries, Mandaeans were protected and recognised in Iraq as ‘people of the book’. The Quran describes Mandaeans as descendants of the Sabaeans, and they are popularly known in Iraq as the Subba. Yet the Mandaeans were also oppressed for their beliefs, which clashed with those of Islam and Christianity. My mother, who grew up in Baghdad, remembers being told to keep quiet about her religion by her parents. So when I approached my family to find out about our religion, they knew very little about it. Until The River Winds Ninety Degrees West is a work about my family and their journey in the world. It starts in the small riverside village of Halfaya and moves on to Baghdad, Abu Dhabi and Australia. In the installation, I used photographs from family albums and digitally removed the people, so that the final images were empty landscapes. 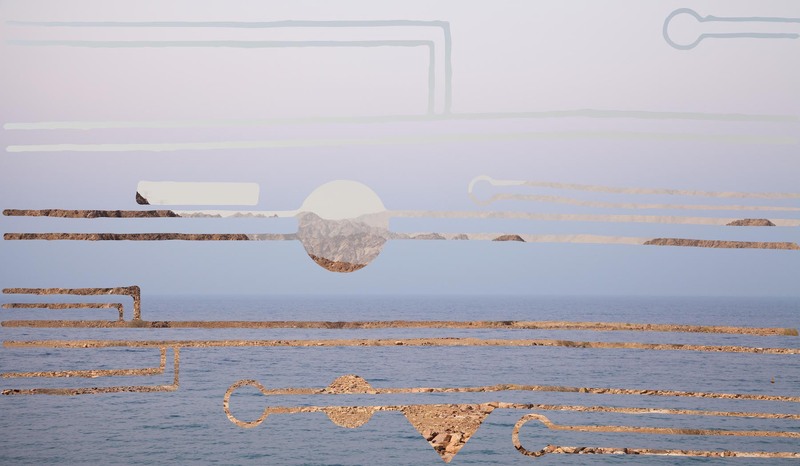 This collage also includes motifs and diagrams from The Book of Rivers, a Mandaean holy book. 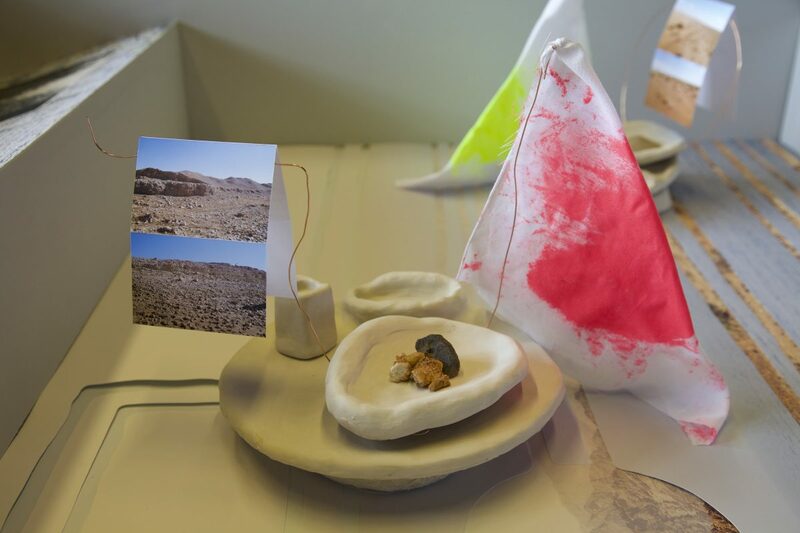 I produced clay objects, including small boats, inspired by the mud artefacts that Mandaeans use for worship, as well as the ancient boat artefacts on display at the Pavilion. View of Nadine Hattom’s Until the River Winds Ninety Degrees West (2017) (c) Boris Kirpotin/Ruya Foundation. Collage based on The Book of Rivers, detail from Until the River Winds Ninety Degrees West (2017). To produce the work, I consulted a range of sources. I made contact with priests, academics and read scholarly accounts of the Mandaeans. I interviewed family members and went through family photographs. I traced some of my ancestors’ journeys on Google Maps, and used Youtube videos to compare memories with the present. First, I approached Yuhana Nashmi, a Sydney-based artist and calligrapher, who once served as a Mandaean priest. Nashmi was initiated in Baghdad in 1997, and left Iraq soon after. Due to disagreements with the Mandaean leadership, he stepped down in 2012. 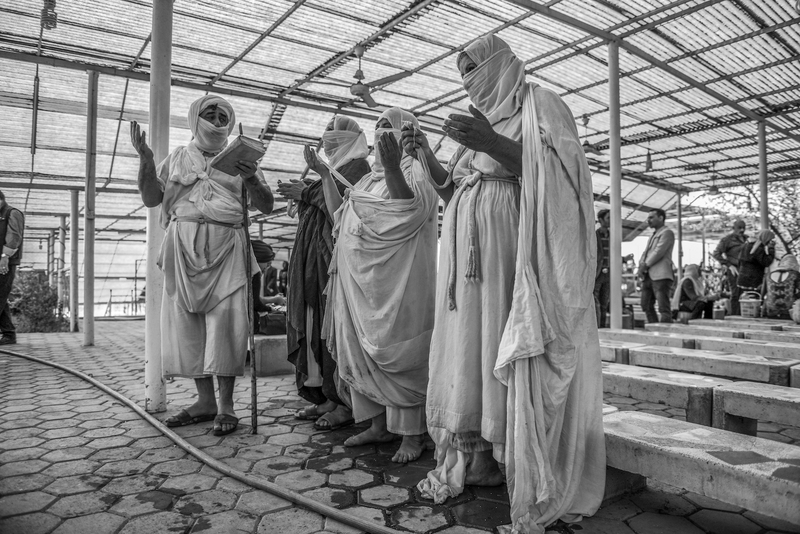 Today, Nashmi documents the ceremonies and rituals of the Mandaeans in Australia, in collaboration with the University of Exeter, UK. As he described the specific religious objects to me, I felt he was as curious about my project and about me. (c) Ayman Al Amiri/Ruya Foundation. The oldest representation of the Mandaeans in the West is in François de La Boullaye-Le Gouz’s travel book Les Voyages et Observations, 1657. Later, the British traveller Lady Ethel Stefana Drower translated canonical Mandaic scripture such as the Qolasta and the Haran Gwaitha. She collected a scroll from Diuan Nahrauata (The Book of Rivers), which is housed today at the Bodlean Library. As a child, my father remembered going to a priest’s hut in his village of Halfaya, and being shown the spot where Lady Drower once sat. Our family left Iraq for Abu Dhabi during the Iran-Iraq war, so that my father would avoid conscription. 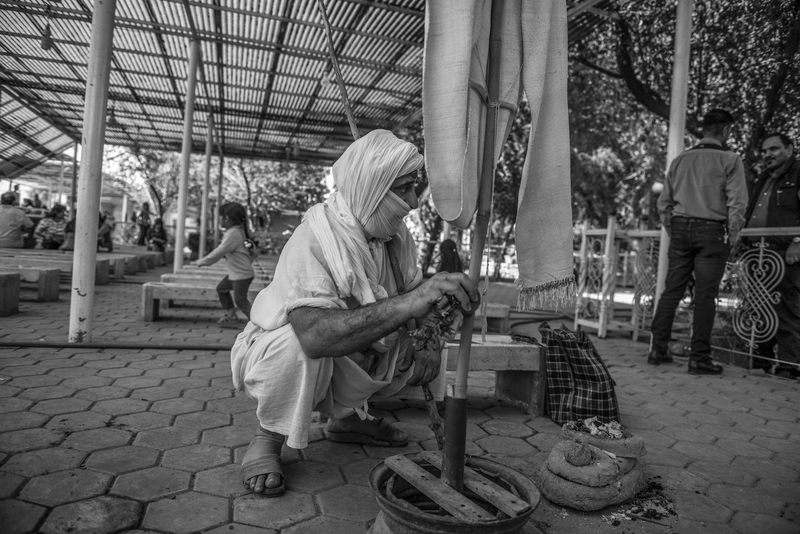 However, many Mandaeans of Iraq became refugees in the 1990s as a result of the first Gulf war. Because the Mandaeans had been so secretive, nobody had heard of them West, and many believed the religion didn’t exist. They struggled once again to legitimise their identity. I then spoke to family about their memories of Baghdad and Iraq. I teased out stories about my maternal grandfather, the silversmith Ghareeb Jabbur Al Saadawi, who owned a shop on River Street in Baghdad. My aunts and cousins recalled that he loved to sing and spoke many different languages. In order to evoke and anchor my father’s memories of Iraq, I sent him Youtube videos of Halfayah, which is known today Al Musharrah. I asked him if that was what it looked like. He said “No. You follow the river until it winds 90 degrees West.” I checked this on Google Earth: the river does not turn West, but North. Memory is inherently flawed and this is what makes it human. Should I correct my parents? Or should I embrace this flawed memory and make it a part of the work? I chose the latter. The inaccurate geographical or historical details become part of the work, humanising how we look at the past. The Book of Rivers is an atlas of the world that isn’t geographically accurate. 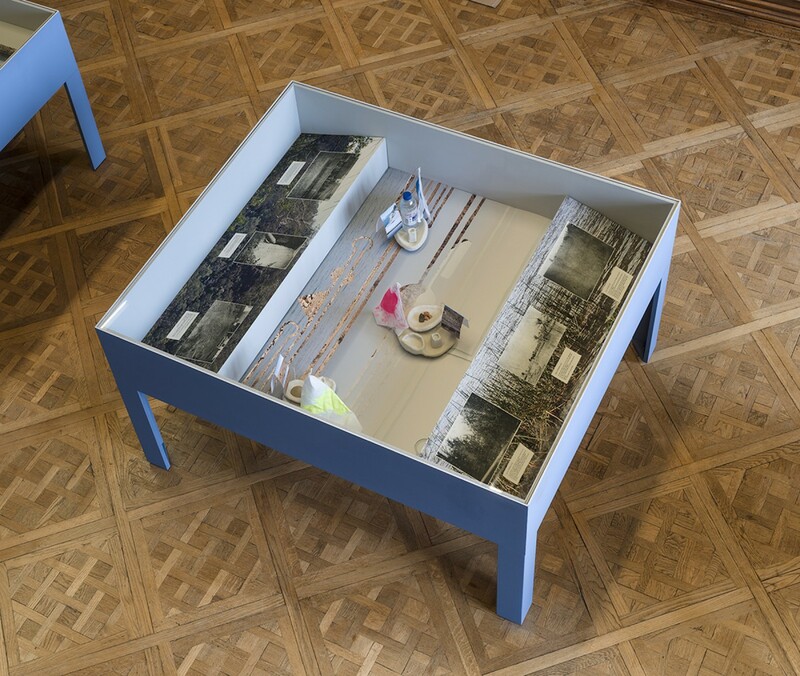 I used its motif in the installation as a map to navigate these disparate memories, images and places. Collage, which is a central medium in this piece, gathers things don’t necessarily belong together. I was influenced by the artists Broomberg and Chanarin’s War Primer II. They superimpose images of the 2003 Iraq war, on Bertold Brecht’s War Primer, his book of collages about WWII. The tears of the paper represent the pain of displacement, of being in one landscape and not in the other. 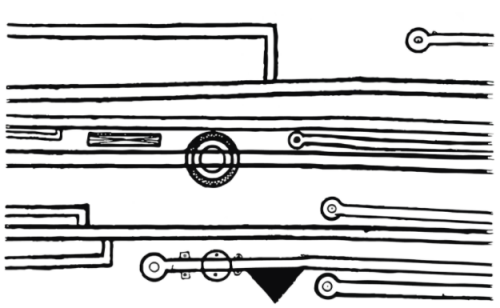 Diagram from The Book of Rivers. As well as images, I produced clay artefacts for this new commission. Through conversations with my mother and father, I learnt that both of their grandfathers were boat makers, and as such, two of the sculptures look like boats. I referred specifically to Lady Drower’s drawings of the clay figures used by Mandaeans. The clay boats that I had produced strongly resembled the artefacts that I later saw in Yuhana Nashmi’s documentation of Mandaean rituals along the Nepean River. I have no recollection of seeing these clay figures before, though I must have done, and they must have lived somewhere in my memory. Prior to making this work, I didn’t even know where my father was born. So much came out of the woodwork as a result of this commission. My extended family started calling me from across the world to find out about the Mandaean religion. On the drive back from Venice to Berlin, my father told us for the first time about why they’d left Baghdad, and how he fled with my mother and two small children. When we arrived at my studio, he asked if he could take some of the clay sculptures back for my grandmother. “She uses these?” I asked. “Yes of course!” was his reply.